There’s a risk of drowning when your work involves being on the deck of a fishing vessel or a seine skiff. In these cases, it is required for a worker to use an approved PFD or lifejacket. There are some things to consider when choosing the right device for a certain job – continue reading to learn more. What is a buoyancy rating? It is the measure of how much weight a PFD or lifejacket is capable of holding up beyond the amount that water normally supports. Aside from your weight, the gear or any material you’re wearing should be taken into consideration too when deciding which buoyancy rating is requited. The minimum buoyancy rating you can go for is 69 Newtons (15.5 pounds) – this is intended to keep an awake person’s head afloat. When working alone, the minimum buoyancy rating changes to 93 Newtons (21 pounds) because a self-righting PFD or lifejacket is required. This type of PDF or lifejacket is capable of supporting an unconscious person’s chest so that their face turns away from the water which is essential when no one is around to help in case of an accident. Check the manufacturer’s instructions on how to properly put it on. Fasten all straps until it fits snugly but does not feel uncomfortable. When tugged upwards from the shoulders, it shouldn’t move up past your nose. Try it out with the clothes you wear at work and if you can, try testing it in a pool and familiarize yourself with how it works. Taking the time to do this will help get you prepared in case of an emergency. Whenever you’re buying personal protective equipment, whether it’s a PFD or lifejacket, it’s always best to check the manufacturer’s instructions first. There you can find important information on what the proper usage is, how to deflate it after use (if applicable), what maintenance is required, how to repack and store it, and all the other important things you should know. 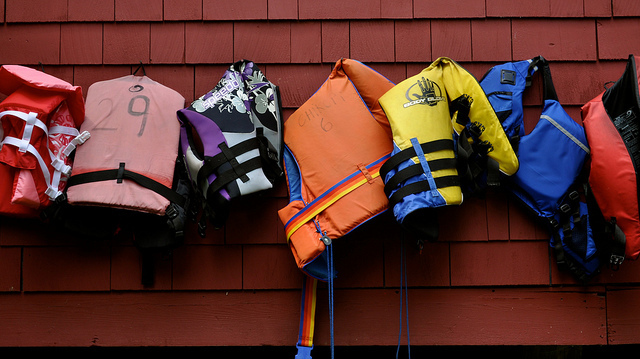 It’s important to keep your PFD or lifejacket in good condition at all times. Report any tears, open seams, rips, or any damage that is enough to cause loss of buoyant material to your employer or supervisor immediately. Any other distinct damage in the straps, fasteners, or any other parts should be attended to too. Last but definitely not least, find the permanent label that shows that your device has met a specific standard acceptable by WorkSafeBC.